We beleive that there are so many ways we can be more ecolonomic in our life. Here is just one more small example – reusing pallets! What can you do with pallets? Well there are so many things. You can use them for gate panels, you can use them for pasture upkeep dragging them behind a four wheeler, you can build small housing from them, and you can use them for livestock housing. We have been using moveable pallet barns here at Mountain Sky Ranch for over six months with much success. They provide protection from wind, rain and snow. They are easy to move around, and they provide excellent sun protection in the heat of the summer. Our structures are about 9′ x 8′ and about 8′ tall in the front and 6′ in the back. 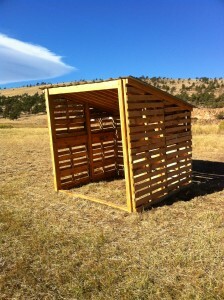 They are made from recycled pallets that we can obtain for between $5 and $8 each. Only the steel roof of this structure is new material. 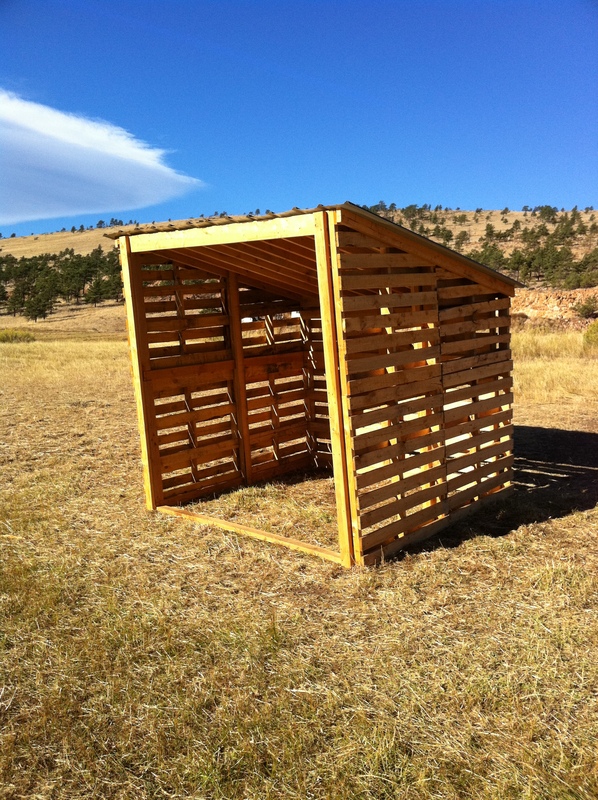 The total hard costs (excluding labor) for these barns is less than $150, a one person can construct one with a circular saw and a hammer in less than 4 hours. If you value the labor time at say $20/hour then the cost of these very effective barns is less than $250! I know you would pay almost $1000 for a commercial three sided barn. You are also doing a great carbon balance act by recycling material that would often be going to landfills. They are actually even better for animal care than hard sided barns because they “breathe” by allowing some air to flow through them, while still keeping out moisture for the most part. Mountain Sky Ranch has many other examples of this sustainable use mentality. We would love to have you come and visit us to see how you could make use of these types of technologies on your own property. You can be lowering your carbon footprint and bettering the planet. Come to our special Celebrate Sustainability Event on October 23, 2010 and see these pallet barns and many other cool agricultural practices.